January 2015 n Performance & Hotrod Business n 69 I have to tell you that it's not easy "keeping to the script." I kept wanting to "modernize" the layout. But I kept true to the original. I had to hand-draw some of the patterns; some I was able to recreate using my Flexi sign program. I cut out paint masks using my cutting plotter. All of the lettering and painting was done using 1 Shot lettering enamels and reducers. The brushes were either large flats or lettering quills. 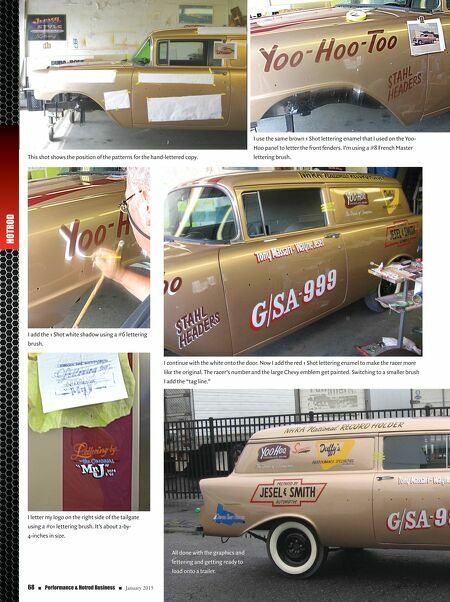 I used FBS fine line tapes for the lettering and graphics. It was both an honor and a real challenge to recre- ate the graphics and lettering that I did for Wayne and Danny Jesel back in 1966. It was great to use only paint again. I also recreated several "Win" decals and a few event decals using my Roland BN-20 digital printer. Keep your Brush wet! –Julian "Mr.J" Braet Julian "Mr. J" Braet is a pinstriper and lettering artist and owns Mr. J's Sign Service in Paterson, N.J. He is also the creator of Xcaliber striping brushes and preservative. Visit Mr. J's website at www.xcaliberart.com for more information about his pinstriping techniques and to see more projects. Send comments to jxcal@aol.com. 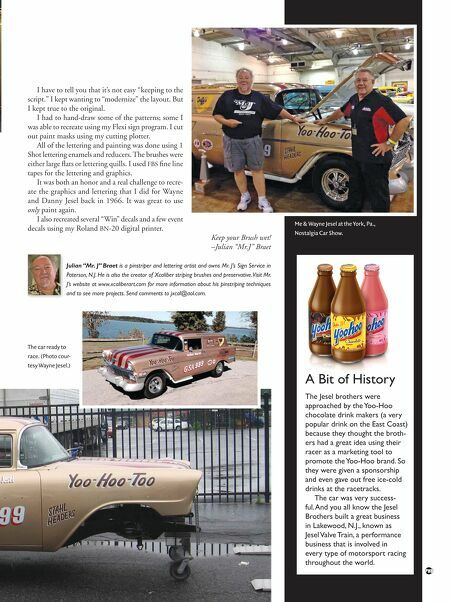 A Bit of History The Jesel brothers were approached by the Yoo-Hoo chocolate drink makers (a very popular drink on the East Coast) because they thought the broth- ers had a great idea using their racer as a marketing tool to promote the Yoo-Hoo brand. So they were given a sponsorship and even gave out free ice-cold drinks at the racetracks. The car was very success- ful. And you all know the Jesel Brothers built a great business in Lakewood, N.J., known as Jesel Valve Train, a performance business that is involved in every type of motorsport racing throughout the world. The car ready to race. (Photo cour- tesy Wayne Jesel.) Me & Wayne Jesel at the York, Pa., Nostalgia Car Show.